U may add carrots and any veggie's u may find suits this dish. Take a wide pan and add thrice the amount of water ,little bit of oil and salt. Give it a boil. Now add the noodles and cook for 3 minutes and strain the water. Do not forget to rinse the noodles in cold water ( normal water).Otherwise will end up noodles sticking each other though we added oil. Keep it aside. Now take all the veggie's and chop it. Slice the mushrooms. In a wide pan / wok, add the oil and heat. Throw in the ginger and garlic and saute. Now dump in onions, and all the veggies one by one and saute it. U may cook this veggie by adding little bit of water/ veg or chicken stock for those who doesn't like eating raw veggies like my family. otherwise u may skip the cooking veggie step and proceed withthe next step. now add the red chilli sauce ,or paste (i've given it seperately, u may check in label section),followed by tomato sauce,Soy sauce,Rice vinegar. Add the salt now. Combine everything well. 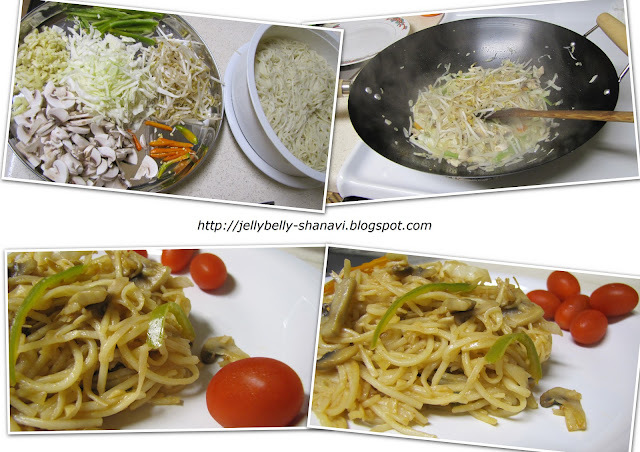 Finally add the noodles little by little and by using two wooden spoon mix it evenly. Likewise ,add the noodles and do the mixing process . Finally add the green onions and serve. I skipped adding green onions since i din't have it. U guys are a good observer .. U know that !? Thanks a lot gals.. Thank u so much for all ur lovely comments..